We ventured up and down the West Coast last month. A road trip North from Portland to Seattle. And a pass through in San Francisco. It has been awhile since we hit the road. 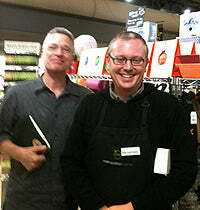 And along the way, stopped in and said 'hello' to a great group of customers and friends. It started here. And it all starts here, our home base for bambu. The food scene is exploding. And biking is a way of life. 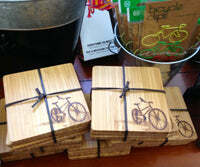 Only natural that we would spot our new Bicycle motif bamboo coasters at the Portland icon store, Powell's Bookstore on Hawthorne. We also stopped in on our friends at New Seasons markets. Really friendly atmosphere and a nice display of our range here. ....and then we headed north. First stop, Olympia, Washington. I think of The Spar Cafe, Olympia Beer and Sleatter-Kinney when I think of Olympia. Now, we think of Compass Rose. New friends, and new bambu customer. 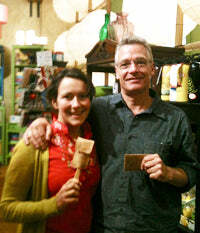 Compass Rose is a wonderful shop of discovery and gifts in Olympia. They carry our organic kids products, Veneerware, and some cutting boards. Met Liz and Alana at the store. Had to pose for a picture. Shared some of our newest products. LOVE for the new bamboo ruler, and the new cork fabric slim wallet (now also available Here). A customer happened to be in the store at the time. She was buying our Certified Organic Bamboo Pots and Pans Scraper. She uses it for......are you ready.........spreading cake frosting. Use #21 for our super-fantastic, multi-use bamboo scraper, spreader, and shaper. The uses are endless. We visited several Metropolitan Markets. They have fabulous stores, wonderfully presented with strong local flavor. They blend in our range really well. We met with Rodd. Took another picture, and learned a lot about his business. And then it was onto the new and fabulous Melrose Market on Capitol Hill to visit Butter Home. Claire has created a little gem of a shop, specializing in unique, well crafted home furnishings and gifts. In fact, our AdjustABowl cork fabric bowls are a store fav! Great use of a small space. Downstairs is the delectable Calf & Kid, artisan cheese shop. They know their cheeses....nice display of our Undercut Cutting and Serving Boards. 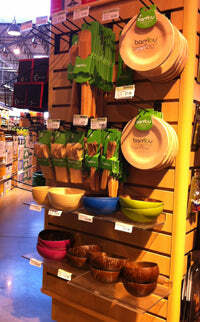 Visited several Whole Foods along the way, and spotted this nice bambu display in their Redmond store. Nice! Unfortunately, it was not really a SF visit....just a pass through the International airport. But one of the best things about the terminal is the SFMOMA Museum Store. Always a treat. Usually a purchase. We were thrilled to see our cork fabric Adjust A Bowl collection and signature Gaby Crumb Board, and our cork Coffee Cuff are a store featured range. And then it was back to China...the West Coast tour turned into the Far East tour...where it continues. Terrific trip, great visits. Where do you want to be? What looks good to you?